Congratulations to Erin F., the winner in Krista's giveaway. Thank you to all who participated! That Hemingway quote was one of the things I was thinking about when writing the plot and creating the characters in Broken Places. How do we go on after the world "breaks" us? 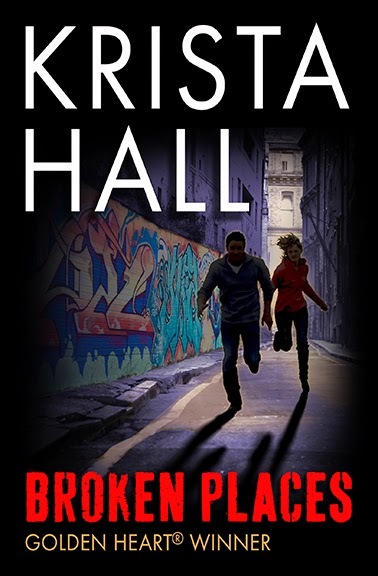 Broken Places is set in a gang-plagued neighborhood in D.C., where sociology professor Trevy Barlow spends her evenings teaching a literacy class for teen girls affiliated with gangs. After one of her students becomes the latest victim of a gang-slaying, Trevy is determined to protect the other at-risk teens in her class—even if it means endangering herself. Throughout the story, a question Trevy struggles with is: What is her responsibility to act in the face of suffering? She's an urban ethnographer who is inserting herself into dangerous neighborhoods where she’s an obvious outsider. She is a witness to pain, suffering, violence, and injustice. How does she balance her personal doubts about the ethical implications of using people’s lives to document societal and cultural phenomena with the need to step in and do something to help the individuals she gets to know? FBI gang task force agent Cruz Larsen grew up rough. He credits his success as a federal agent to bare-knuckled determination and a no-excuses personal philosophy. The meddlesome do-gooder Trevy Barlow pushes all of his hot buttons. He wants to shake up Trevy so she’ll “rip off those rose-colored glasses and take a good hard look at the real world. Then maybe she’d see what he saw. Violence that didn’t care about good or bad, innocent or depraved, right or wrong.” But most of all, he wants her out of his murder investigation. When a key witness, a gang member and the boyfriend of the murdered teen, refuses to talk to anyone except Trevy, she's pulled back into the investigation despite Cruz’s best efforts to sideline her. Now Trevy and Cruz—two people with very different views on how to solve the problem of gang violence in the city—have to find a way to work together. “Haven’t seen him since he left the Fifth District Station. His mother said he hasn’t been home since Sunday morning. Any ideas?” And Christ, it stung to admit that to her. She was shaking her head before he even finished the question. “Forget it, Agent Larsen,” she said, each word a terse, sharp-edged slap of sound. Dr. Do-Good knew exactly where this discussion was heading. A tight jerk of his head was all Cruz could manage. So she thought he was looking for an easy target to blame for Lola’s death. Well, it wouldn’t be the first time someone had thought the worst of him. He was surprised by how much it stung. Broken Places is $0.99 for a limited time on Amazon and Amazon UK! Kindle Unlimited Subscribers read for free! Paperback editions available on Amazon and Barnes and Noble! Can a hero ever be too broken for a book boyfriend crush? Comment below to be eligible for the giveaway: a kindle edition of Broken Places. 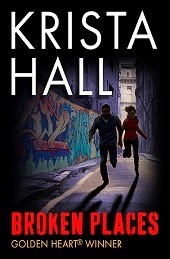 Krista Hall won the 2013 Golden Heart® Award for Broken Places. She lives in the Washington, D.C. area with her husband and children and newest writing companion–a chocolate Lab puppy named Rosie. I recently read a book where the hero was schizophrenic. Extremely well written and researched. There have been a couple of books, however, I didn't think I was going to make it through. Yes, I think there is a limit as to how far you can go and keep the reader interested. Hi Debbie, I agree with you. An extremely broken hero (or heroine) requires an extremely well-written book to make it work. What was the title of the book with the schizophrenic hero? Sounds interesting. Loved Broken Places, Krista! And I love the idea that the healed over places are the strongest. Broken heroes are my favorites. Thanks for a great read! Thanks for stopping by, Carey! I have to return the complement: Loved your suspense thrillers--Confession and Judgment! I love the premise of your story. I love that you are willing to look at the not so pretty parts of life and still find the ability to have love and hope there! I think that there is hope for everyone as a hero and damaged is a relative term depending on your own background. I think the attraction is the ability to move foreward and overcome the obstacles as best you can. Well done! Yay, a Lucky 13 sister! You make a great point, AE. Redemption is so powerful and appealing, no matter how damaged the hero. Thanks for stopping by, AE. I commented this morning, but it's not shown up, so I'll try again. Sorry if you end up seeing me twice. :-) I love to see a damaged hero get his happily ever after, one he usually doesn't think he deserves. I do agree with you, Krista, that an extremely damaged hero needs a skillful hand to write his story. Don't put me in the drawing as BROKEN PLACES is already on my Kindle. Loved it! I haven't met a broken male character yet that I didn't fall for, it's actually what makes hotties more human IMO. I think there probably is such as thing as too broken, but as long as the hero is redeemable, the story will probably work for me. The more tortured they are, the more I want them to get their happy ending! :-) It's like Sarah said, it gives them that human element. Loved BP! So true, Gwen. Like that REM song Sweetness Follows. Thanks for stopping by! Krista, I love your story because it doesn't shy away from tough issues. Powerful! Hi Miranda! I loved writing Broken Places and I loved the characters, even the ones who just kept making bad decisions. I'm so thrilled that you loved it too :-) Thanks! Oh Krista, that's a beautiful Hemingway quote. I can absolutely see its influence on your wonderful characters and story! Glad to hear it! Thanks for stopping by, bn100candg! I'm not sure a hero can be too broken, as long as they still have hope and you can see the possibility of them coming back from the darkness that has them broken. I think they can be. If they are all WOE IS ME about it. Totally agree with you, Mary. Like Sandra said earlier, the best broken heroes usually don't think they deserve redemption, but they keep striving for it anyway. Thanks for sharing your thoughts! Thanks for a great post! I don't think that any hero is ever really past the point of redemption. I guess I just trust the author to make me want to see more :) this looks and sounds fantastic! Congrats to Krista on the new release! Thanks for sharing! THANK YOU!!!!!!!!!!!!!!! I'm so excited to read it!!!! I loved your book, Krista! And sadly, I think they can be too damaged. An unredeemable hero just doesn't work. Congratulations! Maureen, thank you for the opportunity to visit Just Romantic Suspense! It was fun! Thanks! I agree, this is a great place to find RS books! Happy reading! This sounds like a great book! Great post! Thanks, Ashley! Hope you add it to your TBR pile. Happy reading!